The K League Classic moves into round 8 this weekend and includes a number of interesting fixtures. The highlight in our opinion is the clash between 2nd placed Suwon Bluewings and bottom side Daejeon Citizen, which should contain goals but maybe also a shock result. The league table is still developing as only 7 games have been played, however a few sides are starting to build impressive form whilst a few other are find life in the top tier of Korean football tricky. 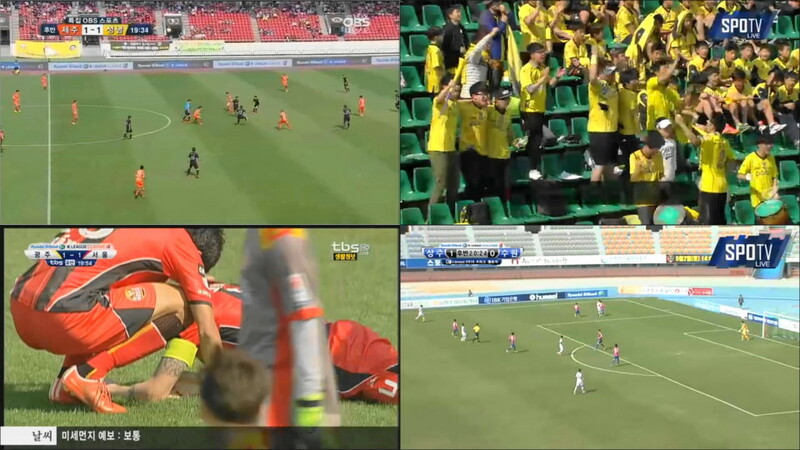 Jeonbuk, Suwon and Ulsan lead the way, whilst Daejeon, Busan and Incheon are currently struggling. Incheon United are still looking for their first win of the season, but have drawn 5 of their 7 games this season. Pohang Steelers have won their last 2 game, but lost the 2 before that. Pohang are on form but Incheon are good at home and are not easy to beat. Sadly for Incheon fans we see another draw. 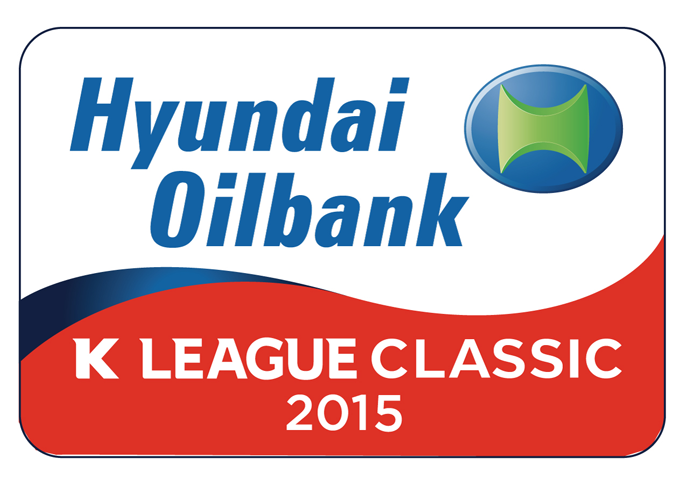 Ulsan Hyundai are currently 3rd placed and unbeaten, but have drawn their last 3 games. Busan are on a bad run losing their last 5 games straight. Ulsan will be heavy favorites against out of form Busan. Seongnam are unbeaten in 4 with 2 wins and 2 draws. They’re also performing strongly in the Asian Champions League. Jeju United are currently in 4th place have won 3 of their last 5 games. This should be a close game and one we see ending all square. League leaders Jeonbuk Hyundai have won 6 and drawn 1 of their 7 games this season. 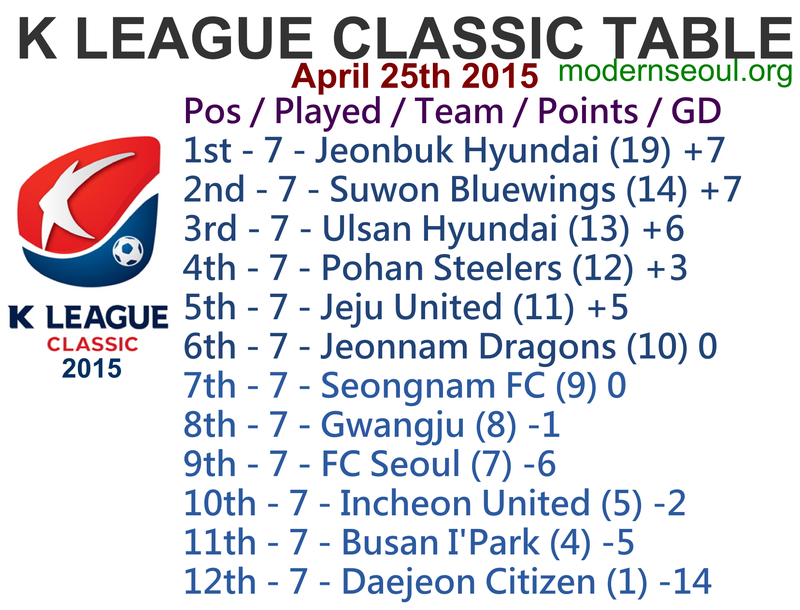 Jeonnam Dragons are currently mid table, but have only lost once so far this season. Jeonbuk have the best defensive record in the league and will be favorites to take home all 3 points, however it will be close. Gwangju have only 1 points from their previous 4 games. FC Seoul suffered a shock hammering in their derby match last weekend and are currently down in 9th, one place below Gwangju. Gwangju aren’t great at home (currently Mokpo), whilst FC Seoul are poor away. Therefore sadly we see this ending in a draw. Suwon Bluewings are unbeaten in 6 and put 5 past rivals FC Seoul last weekend. Bottom club Daejeon have just a single point so far this season from their 7 games. Suwon are the league top goalscorers whilst Daejeon have the worst defense. There should be goal and you’d expect a win for Suwon. 3 Correct Results with 2 perfect scores. Round 7: 3 correct results but no perfect scores. Round 6: 5 correct results from the 6 games, with 2 perfect scores. Round 5: 2 correct results but no perfect scores. Round 4: 3 correct results but no perfect scores (same as Round 3). Round 3: 3 correct results, but no perfect scores. Round 2: 2 correct results both perfect scores. Round 1: 2 correct results with 1 perfect score. 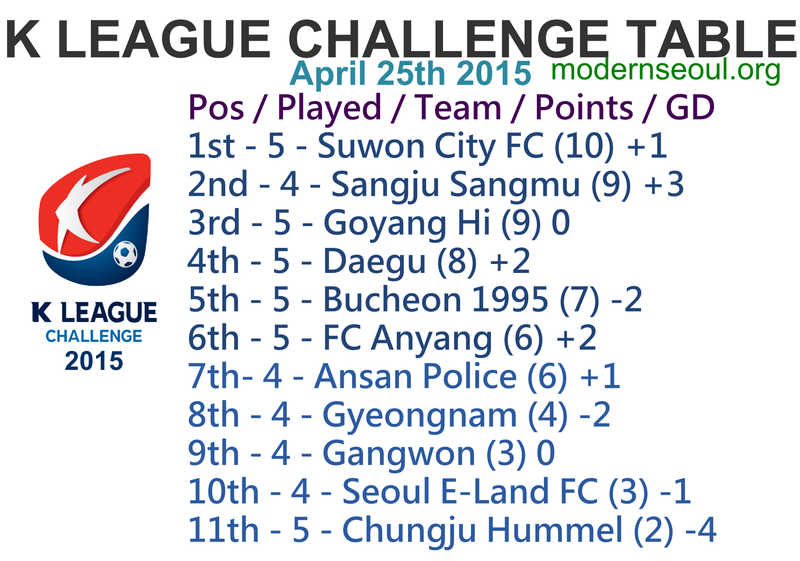 The K League Challenge moves into it’s 6th round of the season and is still very close and competitive. In fact only 8 points separate the whole league at this point, and a couple of wins could move a team up from near the bottom and into the playoff places. There are 5 games this weekend with all of them looking interesting, however the clash between top 2 sides Sangju Sangmu and Suwon City stands out. The K League Challenge table is still developing. Suwon City FC, Sangju Sangmu and Goyang Hi currently lead the way, with Chungju Hummel sitting at the bottom of the table with Seoul E-Land FC and Gangwon just above them. There was little movement from round 5 to 6. 3 correct results with one perfect score from this weeks 5 games.